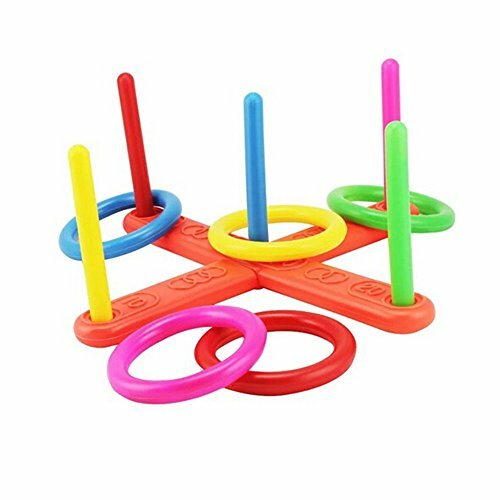 Children will have tons of fun throwing rings at the targets and mastering their aim with the classic rope quoits set. The traditional ring tossing game is incredibly simple to set up. The two plastic frame pieces simply lock together to form a cross shaped board. Five plastic poles simply slot into holes at the four ends and centre of the cross. The traditional quoits set is perfect for indoor or outdoor play so, whether sun, rain or snow, it'll provide the family with fantastic fun and entertainment. Each scoring arm measures 51cm. The spikes each measure 17cm. The hoops measure approximately 13cm in diameter. If you have any questions about this product by Giveme5, contact us by completing and submitting the form below. If you are looking for a specif part number, please include it with your message.